Hand applying makeup on woman. Side view of lady's face. Busy day of visagist. Actress before shooting. Brush applying makeup on lady. Girl's face with closed eyes. Actress must look perfect. The skillful visagist. Woman's hand applying makeup. Face of a young female. Every visagist is an artist. Model before photoshoot. Female hand applying makeup. Face of a young woman. Visagist busy at work. Add more color. Visagist applying foundation, male face. Hand of makeup artist, sponge. 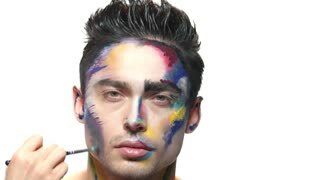 Man having artistic makeup applied. Hand of visagist, brush. The face of art. Hand of visagist applying makeup. Female face, beautiful eyeshadow. Hand applying makeup, female face. Visagist using pencil and brush. The bright side of fashion.